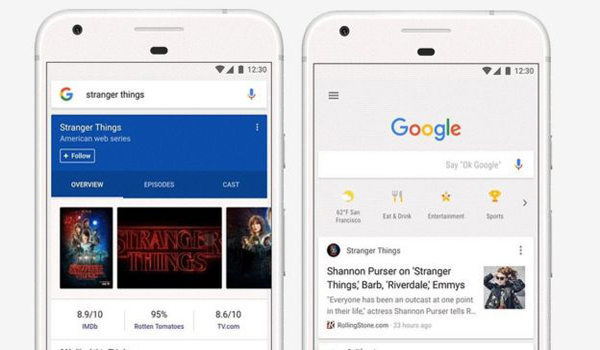 Users will also be able to click a "follow" button on search results to add topics of interest to their feed. "Google has a strong incentive to make search as useful as possible," said Mattia Littunen, a senior research analyst at Enders Analysis. "Facebook's news feed is one of its main rivals. It is competing with other ways of accessing content." Google is known for its sparse homepage, which, though mostly white space, has, according to analytics firm Alexa Internet, become the world's most-visited website. "To provide information from diverse perspectives, news stories may have multiple viewpoints from a variety of sources... and, when available, you'll be able to fact check," the company said in a blog post. "Search ads are more lucrative than in-feed ads such as Facebook's," said Mr Littunen. "Google's business is based on selling advertising, so this gives them more contact points with consumers." "Google has a long term project of anticipating user needs. It's a move to make sure people aren't going elsewhere for information," he told the BBC.